Smurfette (Demi Lovato), Brainy (Danny Pudi), Hefty (Joe Manganiello) and Clumsy (Jack McBrayer) in Columbia Pictures and Sony Pictures Animation’s SMURFS: THE LOST VILLAGE. ©CTMG. 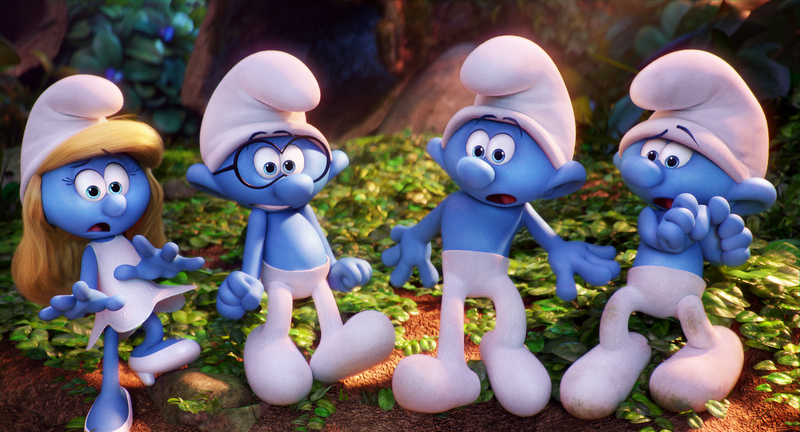 HOLLYWOOD—The Smurfs return to the big screen on Friday April 7 for another adventurous outing. 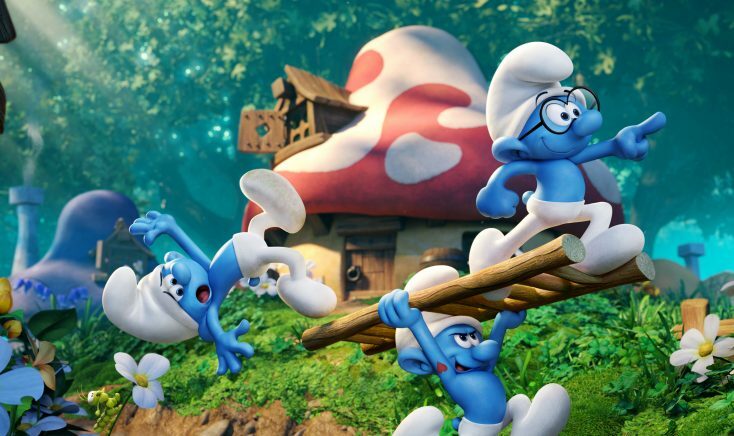 Unlike previous big screen installments of the beloved comedy franchise based on Belgian artist Peyo’s characters, which combined live-action with animation, “Smurfs: The Lost Village,” is fully animated, and the characters are drawn to look more like the original Smurf comics. Directed by Kelly Asbury (“Shrek 2”) from a screenplay by Stacey Harman and Pamela, the comedy adventure follows Smurfette and her best friends Brainy, Clumsy and Hefty on a race through Forbidden Forest, which is filled with magical creatures, to find a mysterious lost village before the evil wizard Gargamel does. Voice cameos include celebrity chef Gordon Ramsey (Baker), comedian Gabriel Iglesias (Jokey), Tituss Burgess (Vanity), Jeff Dunham (Farmer), Jake Johnson (Grouchy) and director Asbury (Nosey). Two previous “Smurfs” feature films (2011’s “The Smurfs” and 2013’s “The Smurfs 2”) starred Neil Patrick Harris and Jayma Mays, along with an all-star voice cast that included Manganiello’s real life wife Sofia Vergara as Smurfette. At a recent sneak peek held at Sony Pictures Animation’s studio lot, Lovato, dressed in a long, red sleeveless dress and Manganiello, dressed all in black, joined director Asbury to talk about the upcoming release. Q: Joe, were you into Smurfs as a kid? Manganiello: I was, yeah. Every Saturday morning my brother and I watched “The Smurfs.” I remember I had some of those vinyl stickers that looked like a Smurf village and you could pull them off, stick them on and re-stick them. I remember having that. Yeah, I remember seeing every single episode growing up. Q: Demi, you weren’t as familiar with them, were you? How did you learn about them in order to play Smurfette, one of the most famous of all? Lovato: I think by just asking my parents (and) looking up “Smurfs” videos on YouTube. That’s how I did my homework. Q: What shared attributes do you and Smurfette have? Lovato: I think we’re both brave and we’re both curious when it comes to going after things that we want to figure out. We’re both driven. Q: You’ve done many things in your career from acting to performing on stage to judging on a music competition show. Now, for the first time, you’re doing an animated voice. How does that compare? Lovato: There’s an element of consciousness when you are on stage or in front of a camera. You want to make sure you’ve got good angles and what not but when you’re doing a voice-over, you can be extra animated and show up in your sweat pants if you wanted to. So, that was a plus for me. I loved not having to do through hair and make-up. But being extra animated kind of reminded me of my Disney days when I played such an over-the-top character on the sitcom I was on (Disney Chanel’s “Sonny with a Chance”). It was similar but also had its differences. Q: Joe, I’m sure it’s weird playing a character named Hefty but do you have to make a face to get that voice like if you have to say a line like, “I’m punching us outta here,” that’s not just Joe. There’s some extra oomph, isn’t there? Manganiello: Yeah, but you’re not really conscious of it. You’re just going for it. He’s really fun because he’s this big (indicates tiny) but he’s this strong (indicates a lot) so I think it was fun kind of packing all of this (big) strength into this little guy which is where the comedy and the heart comes from. Q: Will Demi have a song in the film? Asbury: No. Chris Lennertz did our score and Meghan Trainor has done a song for the end credits. There is a song that Chris Lennertz wrote so the movie is stitched together emotionally with song moments but not characters visually singing. Q: How does Smurfette feel about meeting other female Smurfs? Lovato: Smurfette is definitely excited and she’s curious at meeting other characters that are similar to her after being in a world where everyone has their own identity is really exciting. Previous PostPhotos: ‘Light Between Oceans,’ ‘The Code,’ ‘Peanuts,’ More on Home Entertainment … plus giveaways!! !